NetQ Multimedia has been providing structured cabling design and installation services since 1985, starting as a subcontractor to many computer resellers such as IBM, Dell, Clancy Paul, Computerland, TransNet, Entre’ Computer Systems. These companies were the first to serve the State of New Jersey using the original NJ Mini-Micro term contract that was in place for almost two decades and was eliminated just a few years ago. We were then awarded our own state contract vehicle. Because of our many years of experience, we know what it takes to serve the public sector community, from the smallest municipality to accounts as large as the Department of Corrections. We installed the very first Category 3 structured LAN cabling system for the NJ State Police Headquarters in West Trenton in the 1990’s. We installed the first structured Category 6 and Fiber Optic cabling in all twelve State Prisons and DOC Headquarters campus in Trenton, and the first VoIP system cabling in the Office of Legislative Services just a few years ago. We have also worked in the Salem Nuclear Power facility installing security equipment in “hot” areas of the reactor building, as well as many other high profile government locations. Our history of working with these agencies shows that while the state’s requirements have changed over the years, our company has changed with them. We have certifications for many different cabling solutions and varied manufacturers relationships as required, and we also have our staff trained in any solution that is required for each project. We still feel that providing personal involvement with our accounts is better than the big corporate approach. We provide direct access to the project staff through a single point of contact and provide cell phone numbers and direct email to increase efficiency of our responses. Nobody is put on hold for more than a few seconds, if they choose to call the office 800 number. We encourage our staff to return voice mails the same day or no later than the next business day. Our office staff is well versed in managing municipal, county, and state purchase vouchers and VCard transactions. We are also experienced in Cooperative Purchasing having managed Mercer County and Union County term contracts, which were the first of their kind at the county level. 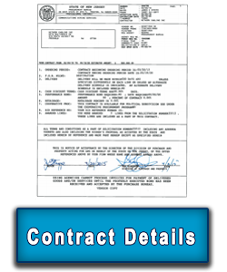 These were Maintenance Term Contracts that made us responsible for daily repairs as well as new installations of Voice, Data, and Video communications cabling and equipment for all their locations. Many of our skilled IBEW Union Technicians are provided with a service vehicle outfitted with all the materials and sophisticated test equipment necessary to perform the services our customers need to install, diagnose or repair all the structured cabling components required to make their systems function properly, most times without a second trip. Since our labor prices are predetermined, our customers know what they will be charged once our technician arrives and determines the required services needed on the spot. If a quote is needed, we can then prepare and email the quote to the agency in a few hours. We also work with their Purchasing Department to make sure they know what commodity code and state contract to use. This makes the process much faster so the end user can get the services they need to keep their agency running smoothly. We are also well versed in utilizing the T1778 Contract working as a General Contractor to assist the Agency with procurement of materials using the established pricing with one of the state’s contracted vendors. As a seasoned statewide Contractor, our office is strategically located in central New Jersey (Freehold) providing access to all major highways allowing us to dispatch our staff to the farthest points of the state in the shortest amount of time. We have also distributed our service vehicles to the north and south and our technicians take them home, allowing for the closest technician to reach the site as quickly as possible. Documentation and record keeping is another area where we add value to the State’s Structured Cabling Infrastructure. We have been adding to our library of floor plans and As-Built drawings of all of our installations for over 20 years. We have clearly documented almost every cable installed at most of our customer’s sites. Many times this becomes invaluable when troubleshooting, installing additional cabling or upgrading the electronics at one of these sites. We also have test results for every cable we install, allowing us to go back and compare, review or investigate changes in the cabling system years after being installed. As an example, this may be invaluable when a Fiber Optic Cable has been disturbed by an excavation. Having recorded the original install and test results, we can quickly assist the agency with diagnostic services, locating the problem and repairing it quickly. We can provide your Contract Manager with installation updates, repair and service call reports to allow for tracking and budgeting of future contract needs. A perfect example of the importance of record keeping recently came to light after super storm Sandy hit the Jersey Coast. Recently, we were called by the Telecommunications Staff at NJDEP to look into telephone problems at Island Beach State Park. The storm had corroded many of the connections and destroyed equipment all along the 10 mile stretch of the island. Since NetQ Multimedia installed over 7 miles of 200pr cabling on the Island a few years ago, our knowledge and documentation was put to use to restore the services to the Coast Guard buildings and Governor’s summer house and other support facilities on the island. This same good record keeping could easily be used to restore services after any catastrophic event, natural or otherwise.